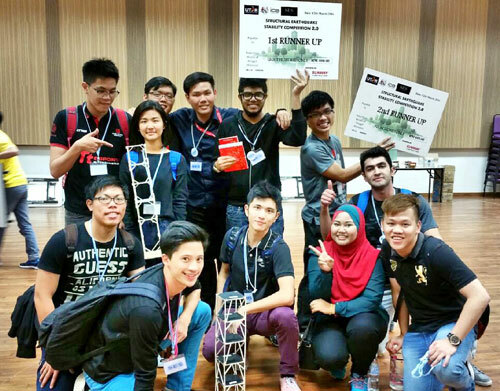 Civil Engineering students from INTI International University INTI) showcased their knowledge and prowess when they emerged as the first and second runner up at the national Structural Earthquake Stability competition held on 12 March 2016. The students were awarded RM800 and RM600 respectively courtesy of Sunway Construction Group Berhad, the main sponsor of the competition. 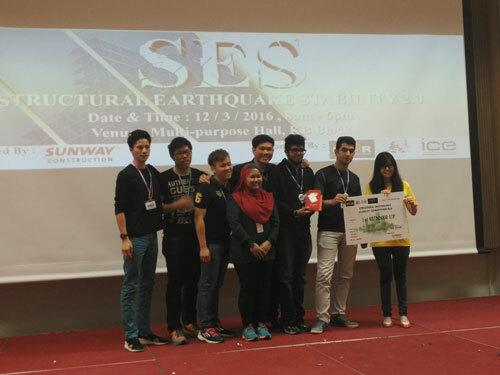 Organised by the Institute of Engineers Malaysia and the Institute of Civil Engineers student chapter in UTAR, the competition which is now in its second year aims to raise awareness among civil engineering students about the importance of earthquake stability in building structures. It was introduced shortly after the unexpected tragedy which struck Sabah in 2015 as an effort to prepare future civil engineers to include earthquake stability measures in their structural developments. Acting as advisors for the team was Lee Hoong Pin and Ms Nurul Hidayah Binti Roslan, lecturers from the Faculty of Science, Engineering, Technology and Mathematics at INTI. Competing against 16 other teams from private and public institutions of higher learning, the students put their innovation skills to the test when they had to develop a two-directional moving table to replicate the movements caused by an earthquake. The strength of their models were likewise tested as they had to withstand the simulation of a magnitude seven earthquake, a new element to the competition which made it significantly harder compared to 2015. “Participating in these competitions provide our students with the opportunity to gain hands on experience and enhances their knowledge. This empowers them with practical ideas and a sense of confidence which gives them an edge when they enter today’s competitive workplace,” concludes Lee.